The procession of the suffering ones has been ongoing for some 156 years. Lourdes is one of those places on earth that has perhaps seen more tears than any other. Still they come, or they are brought from all over the world. We see them obviously in need of physical cures, or know that they have come to ask for hidden favors. Some return to offer thanks. Others go for those who cannot go themselves. A grotto shrine remains where the Virgin appeared to a girl, Bernadette Soubirous, for the first time on 11 February 1858. The Lady clothed in white who appeared there revealed herself the Immaculate Conception. Sinlessly conceived, she remains the emblem of purity that a fallen and wounded humanity aspires to. She is, after all, the one who bears God into the world. Her sinless soul is a thing of beauty, startling confounded hearts trapped in disbelief. What is all this? And why do we still flock to a cave on the side of a rock along a French river? Is it pure sentimentalism? Is it excessive marian devotion? Is it the fear of bodily pain or the incapacity to bear more of it? Is it vanity disguised as oration? Is it skepticism that curiously drives us to see what the masses believe? Does an unnamed interior struggle impel us to go there? Why would we decide to arrive there to bathe in holy waters and pray? It can be argued that human suffering is inescapable. Some experience this reality in more obvious ways than others. Think of victims of war, religious persecution, famine, terrorism — violence of all kinds that has existed since time immemorial. Some experience suffering physiologically: illness, disability, weakness, mental anguish, addiction. And some experience suffering interiorly: skepticism, discontent, a perplexing indifference, chronic unhappiness, a directionless existence, a darkness of belief, the privating severance of death. Whether public or private, suffering is real and it has value. Faith redefines suffering. Lourdes is a testament of this. While many have come away from the grotto shrine receiving inexplicable and documented medical cures, the majority of the stories of transformation that are recounted by those who visit the grotto play themselves out in less dramatic ways. Conversions, repentance, vocations, incredible acts of charity and selflessness all reveal the place to be a chosen home of grace. To each is given in the measure of faith and hope. And where there is no faith, a portal perhaps is opened through the observance of the sea of souls who pray. There, a procession of oration and praise becomes the mantle of protection for the cold and hardened heart. The private drama of conversion is perhaps the greatest untold story of this place. It unfolds quietly. Waiting, often in silence, sometimes for years, until the interior pain compounded with the physical somehow rebels, it breaks forth and brings souls to their knees before a torch lit wall of prayer by the mouth of the cave. 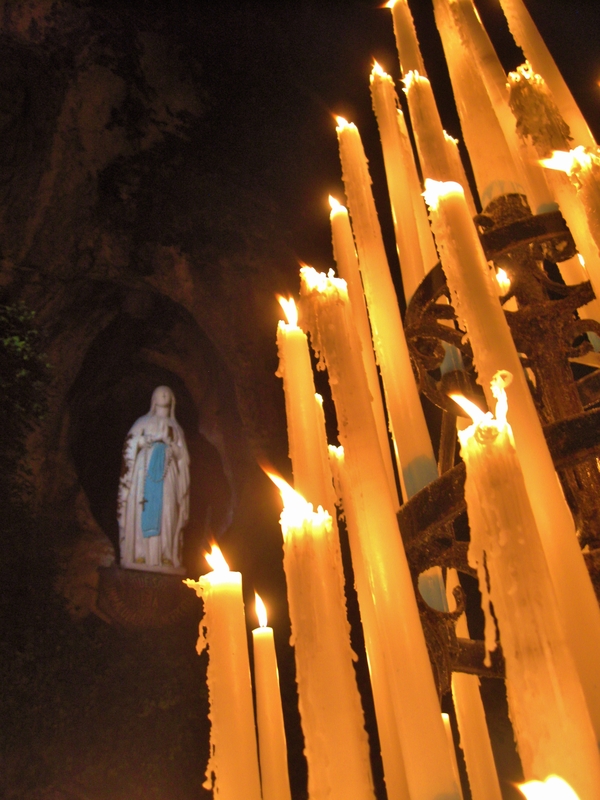 Lourdes stands as the light on the valley floor telling the story of human need. Torches burn throughout the night — endless flames, purified prayers. As the beeswax of olden temples, the wax fountains drip into furnaces that produce still more candles; an endless litany of light, and prayer, and hope. Suffering is is purified in the refiner’s fire. Wounds are bathed in the healing waters. Faith burns there, palpably. The processions have stopped. It is a late summer night. The chill of the French Pyrenees meets the humidity of the river basin. Beside the sea of light there is warmth. The flickering flames emit the fragrance and hiss of burning wax; a canticle of love turned sonata for the interior nights of faithless souls. God dwells there at the grotto cave, His Mother at the door. The children are coming home. The light of faith refines suffering into worship. Love, believes. –St. Bernadette Soubirous, personal writings.